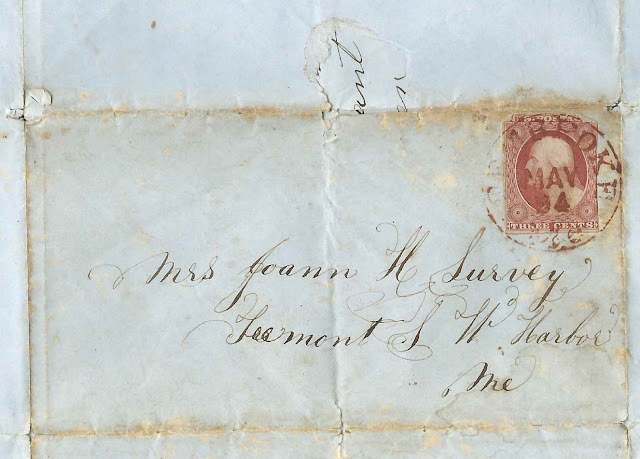 Letter dated May 23, 1852 and postmarked May 24, from Joann Mayo Hersey and her mother Constance (Mayo) Hersey at Pembroke, Maine, to Constance's sister Joann H. (Mayo) Lurvey at Tremont, Southwest Harbor, Maine. The letter consists of two pages of interest to family historians of the Hersey, Mayo, Lurvey and Lurchin families of Maine's Washington County and Hancock County. 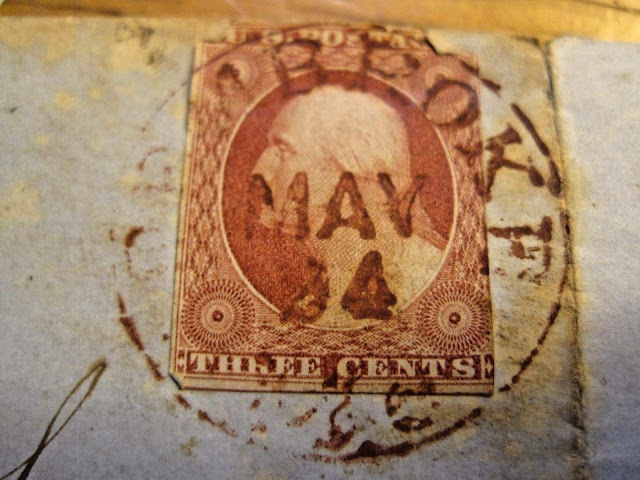 Also of interest, in this new era of DNA testing of artifacts, is the postage stamp - possibly a brick wall buster! A transcription of the letter appears at the end of this post. If you notice errors or can fill in any blanks, please leave a comment or contact me directly. People mentioned in the letter, in alphabetical order. Adelaide Veola Hersey; daughter of Zadoc Lewis Hersey and Catherine (Stoddard) Hersey; Adelaide was born in February 1852 and would marry Alden Bradford Kendrick in 1878. Joann Mayo Hersey (1835-1912), letter writer and daughter of fellow letter writer Constance (Mayo) Hersey; future wife of Leonard Shaw Lurchin, whom she married in 1854. Reuben F. Hersey, son of Zadoc L. Hersey and brother of Zadoc Lewis Hersey; married Mary L. Crane; was living with his family and father at Galesburg, Illinois at time of 1850 Census. Zadoc L. Hersey (1779-abt 1854); he was unwell, according to a letter from his son Reuben, with whose family he was living in Galesburg, Illinois but Reuben indicated Zadoc wanted to return home. If you have information on any of the people mentioned above, please leave a comment or contact me directly. I now sit down to write a few lines to you to let you know that we are all well at present and hope you are the same. I received a letter from you in January and wrote back to you again but we have got no answer and I thought I would write again. I have no particular news to tell you. Pa [John Henry Hersey] is to work on the vessel now and when he is down there he is going to work on the ship for six months. Zedok [presumably Zadoc Lewis Hersey] is clerk in Foster's store. Catherine [Catherine (Stoddard) Hersey, wife of Zadoc Lewis Hersey] has got a baby born in February. She calls it Aderlade [Adelaide Veola Hersey]. She has three children now. Henry [Henry H. Hersey], is five years old and he can't talk so well as Edwin [John Edwin Hersey, "Edwin", son of letter writer Constance (Mayo) Hersey and brother of letter writer Joann Mayo Hersey]. He can say but a few words plain. Mr. Hersey [Zadoc L. Hersey (1779-abt 1854, the aforementioned Zadoc's father] has been very sick. They did not expect he would live for some time but he was better the last time Reuben [Reuben F. Hersey, son of the elder Zadoc, then at Galesburg, Illinois] wrote. He [presumably the father Zadoc] wants to see Zedok very much and he talks of moving there this fall. It is some time since I heard from you and we want to know how do so we write you again, hoping you will answer this soon. Through the Blessing of God we are all in good health and you are the same. I do wish you could come and see me. I want you to Come and all the ___ rest. Tell Jacob [possibly either Jacob Shoppy Mayo or Jacob Lurvey] if he Comes to Calis [Calais] or Eastport to Call and see us, Three minutes if no more. Tell all the folks to write to us and we will answer them. Give my love to father and Mother [Isaac Pepper Mayo and Rosanna (Young) Mayo]. Tell them I want to see them and hope I shall once more. Our Children send their love to you and Granpa, Granma and all their uncles and Aunts. I want you to tell me how father and Mother likes Henry's wife [Henry Mayo and Nancy F. (Smith) Atherton Mayo] and how Henry's health is now and how all the folks do and what they will do this summer. Joann, don't forget me and not answer my questions. If you can't, tell your husband [Samuel Lurvey] to write. If he won't get some of the rest to. I do not know how to hear from you if you will not answer my letter. Tell me about Rebeckah [presumably Rebecca Pepper (Mayo) Robinson]and her family and all you can think of. Give my love to all enquiring friends & Your Mother Lurvey [Abigail (Gilley) Lurvey]. I want to see her so. I remain your affectionate Sister Constance Hersey [Constance Young (Mayo) Hersey]. Do write to me soon and not fail. Again, if you have information to share, please leave a comment or contact me directly.